On the right hand side coming from Fitzwilliam Square West towards Lower Leeson Street. One of the best restaurants in Dublin is tucked away discreetly in the heart of Dublin’s Georgian Quarter. Olivier Meissonave became a familiar figure on the restaurant scene having been Maître D’ at one of Dublin’s Michelin starred restaurants. He then moved on to open his own restaurant, Dax, named in tribute to his hometown in South West France, and where he has delighted foodies for almost a decade now providing thoroughly reliable Franco Irish food in the style of his Gallic native region. Meissonave is a man who knows and enjoys good food and this is reflected at Dax where you can always expect to find the best of Foie Gras, duck, game, and prunes, associated with the rich food and style of South West France. The restaurant menu varies seasonally, but for me I always love the Duck Foie Gras “Au Torchon” with caramelized pear, the sweetness of maple powder, and toasted brioche. It is one of life’s great indulgences and hard to beat. Other starters include Irish West Coast Crab with Passion Fruit gel, red chilli and ginger. Poached loin of rabbit is with beetroot yoghurt, blood orange and hazelnut vinaigrette, whilst salad of goat cheese, Pequillo pepper, and beetroot has candied walnut, rocket and Aged Sherry vinaigrette. Mains include roast duck with Medjoul dates, sweetcorn puree, courgettes, confit garlic and a rich Date jus. Rib-Eye of Irish beef is paired with Fondant Potato, Butternut Squash Puree, Forest Mushrooms, and a red wine jus, whilst braised Irish pork cheek and fillet of pork, comes with sweet potato puree, beetroot, and Sherried prunes. Fishophiles are more than well catered for with seared fillet of Atlantic Sea Bream with green asparagus, white grape gel and Verjus butter sauce, whilst the meaty texture of fillet of Atlantic Hake is paired with spinach, celeriac puree, braised shallots and a red wine jus. Leave room for desserts, which are truly divine, and made in house by Dax’s own Pastry Chef, as are their ice creams, sorbets, and breads. Think of ethereal treats such as Lime and Honey Soufflé, light and zingy as a feather, or perhaps caramelized pineapple with the Asian twist of red chilli, Star Anise, Passionfruit jelly, frozen white chocolate, and vanilla ice cream. If you prefer cheese, as very often I do, they also have an excellent cheese plate – or of course do it properly and have both. It’s so much more civilized. 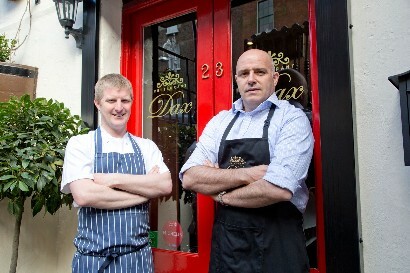 As well as their A La Carte menu, Dax have a cracking Table d’hote menu available Tuesday to Friday nights. If you really want to treat yourself and experience the best of everything, try their 7-Course Surprise Tasting Menu which is jolly good value – you can also have the Tasting Menu with matching wines. The wine list is second to none at Dax.